Online retail sales reached a new $37.2 billion record high this holiday shopping season. That’s up a sizable 15% from 2010. With social networks cited by consumers as their leading online shopping portal (topping both retail and comparison sites), it’s no surprise that many advertisers turned to Facebook this year to place ads and take advantage of the social network’s 800 million active users, engagement and targeting parameters. The Facebook ad marketplace (a real-time bidding marketplace) is extremely volatile, as you can see from the graph above. A number of factors influence CPC beyond creative and targeting parameters, such as time of day, day of the week, competitor bidding and placement strategies, as well as the fact that there is only a limited amount of inventory available on Facebook. 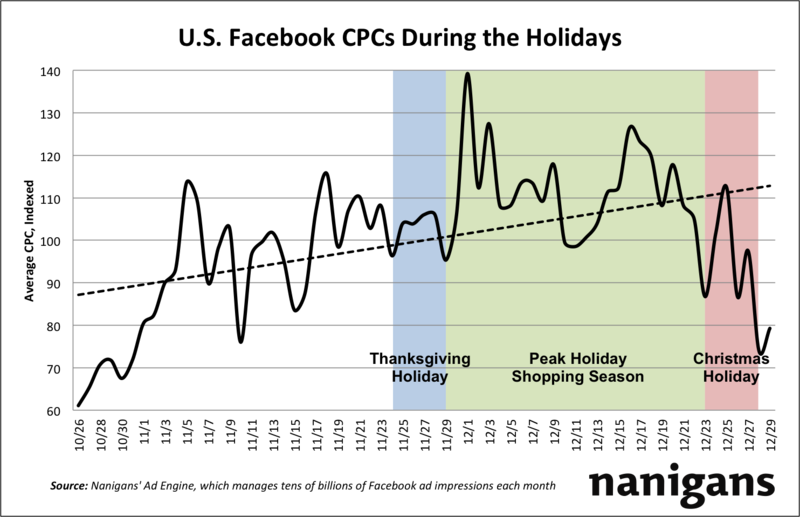 Overall, one of the greatest influencers is demand (and resulting market saturation), which is precisely what we saw this holiday shopping season. We indexed average CPCs from the end of October through the end of December, and the result was a steady upward trendline. Now, post holiday-shopping season, CPCs have decreased to their prior levels the end of October and beginning of November. Was there a similar trendline last year? 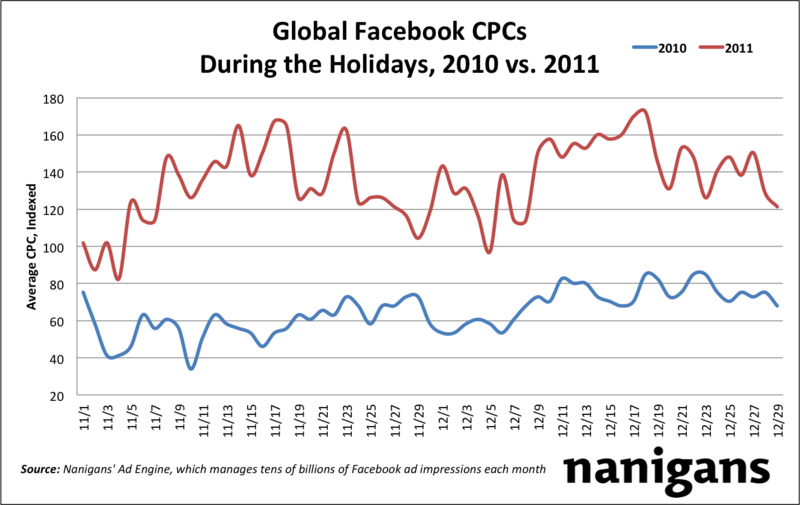 As you can see in the graph below, CPCs remained relatively stable throughout the holiday season, suggesting that there was not nearly as much demand nor saturation in the Facebook ads marketplace. This confirms (like we see every day) that Facebook is increasingly becoming core to brands’ online advertising strategies. Are higher CPCs worth the Facebook ad spend? Absolutely, and especially when you’re optimizing for purchases. But, as we recapped from Fab.com’s, Levi’s, and IBM’s results last month, we’ll let the data do the talking! We hope the above helps inform why your company should advertise on Facebook during the holiday shopping season next year, despite higher CPCs. And if you’re not convinced, a recent eMarketer survey shows that 25% of retailers report their most effective online ad techniques are on social networks, third to dynamic optimization (28%) and retargeting (26%) – both of which can also be done on Facebook. We look forward to keeping you updated about Facebook advertising trends in 2012!